Now, where is the crimson? 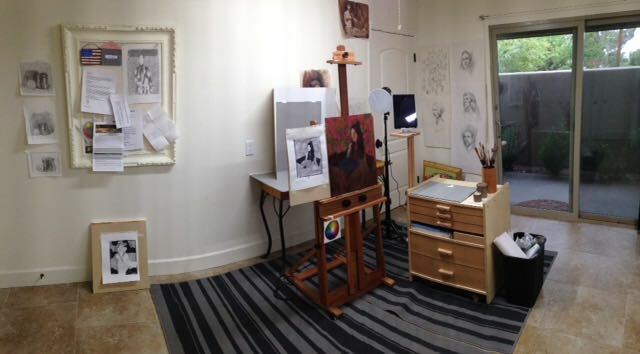 She has told me several times how much she enjoys her new set up, everything she needs is at hand so her creative process doesn’t get interrupted by leaving the easel to search out a special tool or supply. Size & Construction: The most obvious advantage to having a custom taboret is that it can be sized to fit your workspace. If you’re tall or short, the working height can be adjusted. Maybe you like to work standing or sitting on your favorite stool, this taboret can be built to suit that. Mass produced taborets are limited to standard sizes but not with this unit. I’m calling this The Industrial Chic look. By combining the Birch plywood with it’s multiple plies of wood exposed plus stainless steel fasteners there is a no-nonsense, I’m ready to create vibe! Even the shop made drawer pulls echo that look. The taboret also has polyurethane wheels for mobility and the front two will lock into position. Drawers: These are the heart of the unit, a basic taboret will have three drawers that will feature ball bearing, full extension slides. Many artists use this style of palette keeper that can be stored on the shelf to keep it out of your way. Trays can be added for your pencils, charcoal, erasers, etc. Drawers are divided to organize your tubes of paint, brushes, and knives. Deeper drawers can have a sliding tray added to them to maximize their usefulness. If you use a tablet or iPad for your studio work this shelf is an option. The shelf will be sized to fit whatever you may use to support your tablet. It is mounted on the side of the taboret and locks securely at any height with two large knobs. While designing this project I received input from several artists on features they would like to see. These included a way to adjust the angle of the palette, additional brush storage off the side, and a dedicated well space for your turpentine. These, and most other things you may require can be incorporated into the taboret. My goal is to make your creative process as seamless as possible by having your work space actually work for you! Not a “knock down” project or import that you have to put together yourself — this is a one of kind unit designed and built just for you. Pricing will vary depending on the size and optional features you’d like, $500.00 would be the starting point for a basic model. The one shown has additional drawers and the iPad mount. Shipping is really not an option due to the size and weight. Contact me and we’ll design one to suit your requirements. I enjoy the challenge of designing of creating artists furnishings to suit their needs. If there is something unique you’d like to see in your taboret let’s see if we can work that out. This entry was posted in Artist, Artist Furniture, custom furniture and tagged artist taboret, artist work station, artists, Baltic Birch plywood, brush storage, custom artist furniture, custom taboret, paint tube storage, taboret. Bookmark the permalink.